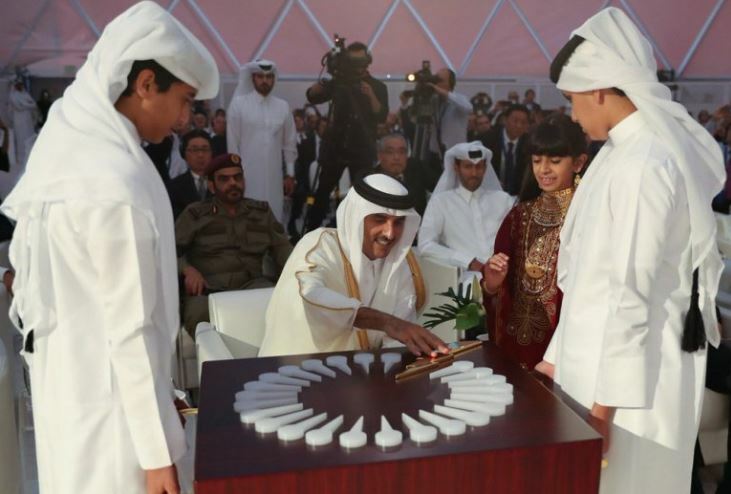 Amir inaugurates Umm Al Houl Power Plant | Qatar Electricity & Water Co.
Doha: Amir H H Sheikh Tamim bin Hamad Al Thani attended the inauguration of Umm Al Houl Power Plant, during a ceremony held by Qatar Electricity and Water Company in Umm Al Houl today. The Amir placed the magnetic piece in the logo of the power plant to officially inaugurate it. Following the ceremony, the Amir toured the power plant. The ceremony was attended by Prime Minister and Interior Minister H E Sheikh Abdullah bin Nasser bin Khalifa Al-Thani, and several ministers and members of the diplomatic corps. Delivering a speech at the opening ceremony, Minister of State for Energy Affairs H E Saad bin Sherida Al Kaabi said that Umm Al Houl plant is one of the most important power projects in Qatar and an addition to the long list of projects that the State has implemented to support comprehensive development in the country. The minister pointed out that the plant is capable of generating 2,520 megawatt of electricity and 136.5 million gallon drinking water per day, which meets 30 percent of the country’s needs of power and 40 percent of its desalinated water. The Minister pointed out that this project, despite all challenges, has been completed on time and within the estimated cost of about QR 11 billion, using the highest technical and international standards and taking into account the least impact on the environment. He praised the importance attached by the management of Umm Al Houl Company to the security and safety of workers at the site, in which more than 14,000 workers were present at the same time, and the company that implemented the project registered 69 million hours without accidents. The minister also welcomed the partners in the Umm Al Houl project, Mitsubishi and JERA from Japan, who have strong cooperation with Qatar for more than 50 years in the field of oil and gas and in the construction of power plants and water desalination. He also praised all those who contributed to the completion of this project, including Qatar Electricity and Water Company, Samsung and Hitachi, as well as local construction contractors, led by Al Jaber and Mott MacDonald companies that oversaw the project in the design and implementation stages. For his part, Fahad bin Hamad Al Mohannadi, Chairman of Umm Al Houl Power Company and General Manager of Qatar Electricity and Water Company, said that electricity is an essential support of the economy in any country in the world, and water is also the most important component of human life. That is why most countries are keen to provide the electricity needed to advance the economy in addition to securing their water needs. He added that electricity and water sector in Qatar are among the important sectors to which the State is attaching great importance and has invested in it locally and globally. He said the importance of Umm Al Houl Power project lies in the manner in which it combines efficiency of performance through optimal utilization of natural gas and the diversity of the water production mechanism, through optimal use of thermal energy and reverse osmosis technology, which are considered the best in terms of the environment, pointing to the strategic location of the project that feeds both Doha, Al Wakra and the industrial area, as well as its connection to the major reservoirs. He stated that the project was completed before the contractual date, adding that participation in such a project is a real proof of Mitsubishi’s strategy. He expressed satisfaction at contributing to the stability of the electricity and water supply in Qatar. He added that Mitsubishi directors will be delighted to participate in new business opportunities in the future to contribute to the overall development of Qatar. Furthermore, a short film about the power plant, its production volume and its role in providing electricity and water was shown during the ceremony. Umm Al Houl power plant is one of the largest water desalination and power generation plants in the region. It represents a great addition to the water and electric security in Qatar. It also uses modern technologies that protect the environment, ensures water production and generates electricity at the highest standards and quality. QEWC owns 60 percent of the Umm Al Houl power planet, Qatar Petroleum and Qatar Foundation own 5 percent each, and Mitsubishi-TIBCO owns the remaining 30 percent.